There is a simple explanation of Edward Lambert's concept of Effective Demand. It is provided by Angry Bear blogger, Steve Roth. This is just an explanation that we all can understand. Applying this guide to the real economy may change your thinking, and certainly will add an economic indicator to your arsenal. 1. Real GDP: During the business cycle, when real GDP goes up, so does Effective Demand. 2. Labor Share: When labor share rises, effective demand increases due to more relative power for household consumption demand. 3. Capacity Utilization: When capacity is heavily utilized, then it costs more to produce goods. 4. Unemployment Rate: When unemployment declines, effective demand declines. At the full employment limit, it is difficult for the economy to produce more. Full unemployment constrains future growth. 5. 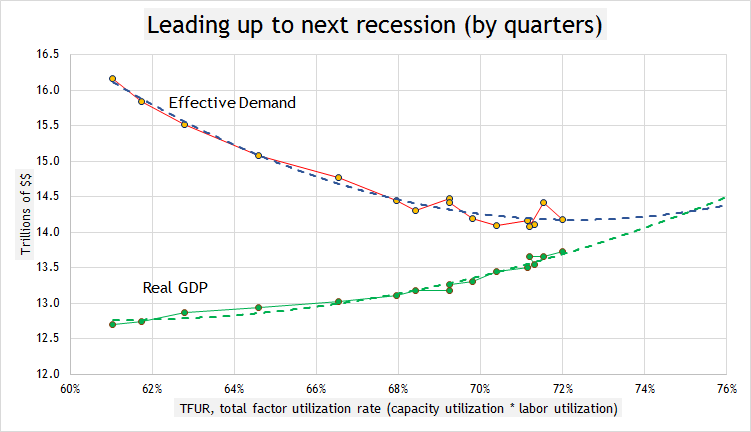 Effective Demand Limit: Real GDP increases as more capacity and labor is utilized. However, there is a limit set by the relative power of labor's share of income to purchase goods. This is not an issue during the business cycle but becomes a problem at the end of the business cycle. As you can see, the ends of business cycles (beginnings of recessions), are characterized in this model by a stylized fact: real GDP approaching or exceeding this measure of effective demand. Capacity utilization increases quite smoothly up to that point (the “good” part of the business cycle), then declines (often after a chaotic period that can last quite a while; see 1995-2000). 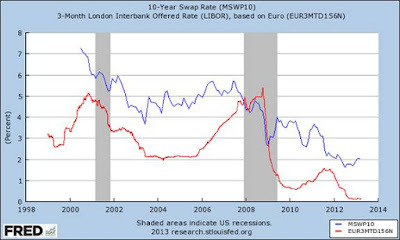 Edward Lambert has said that the US has become overcapitalized compared to the utilization of the labor force. This is certainly something along the possible trap Donald Trump could fall into, seeking to continue the policies of supply side economics which comes across as Trickle Down but is really a limited Trickle Up idea, benefiting a few at the top. Dr. Lambert has said Supply Side Economics contributes greatly to labor losing ground. If the supply of mortgage credit to potential home buyers is rationed, this will decrease the demand for newly built houses. If laborers cannot supply all the labor they wish to, they will have constrained income and their demand in the goods market will be lower. If there is credit rationing, some individuals are constrained in the amount of funds they can borrow to finance goods purchases (including consumer durables and houses), so their effective demand for goods, as a function of this constraint, is less than their notional demand for goods (the amount they would buy if they could borrow all they want to). Lambert measures the effective demand limit as conditions continually change by use of the equation he developed, and it shows when economies are close to getting in trouble. If capital wins big and labor is shut out of purchasing that which is produced, the effective demand limit can throw nations into recession as the end of the business cycle shows a lack of reward for the people who made the products. They do not get their fair share, and potential demand is not realized. There is much more that serious students of economics will find useful as they continue to study Dr. Lambert's effective demand breakthroughs. 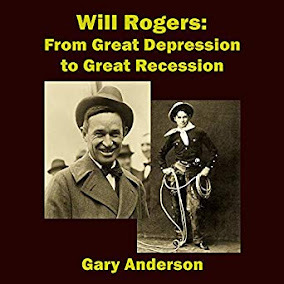 Predicting recessions can be a complex endeavor and having all the tools means including these, as Dr. Lambert has a successful track record in using his calculations.